Change is a funny thing; it’s inevitable because nothing stays the same forever but it’s also really unsettling and hard to cope with. We might be starting a new school, changing year groups, or moving to university. For others, change could involve moving house, moving jobs, or starting new hobbies. Parents might be waving their little ones off to primary school or their slightly bigger ones off to university. We may be making different lifestyle choices, asserting our boundaries or replacing old habits, with new ones. Change can be good but the transition can still feel uncomfortable. Planning and preparation offers us the opportunity to think about things we can do ahead of time to minimise the stress and anxiety we may feel. Whether that be making a list of all the physical things we might need or visiting a new home, or town, to get our bearings before we move there. It could be blocking out time for self-care or scheduling a visit with some loved ones. Planning also helps us to identify what we might need additional support with so that we can consider reaching out for help ahead of time. Change can be a lot to process. There is a huge amount to think about and try to work out in our heads. There’s often a lot to learn all in one go. We will experience new challenges and not be quite sure how best to tackle them. At times we will feel lonely or isolated and miss how things used to be. Having someone to talk everything over with can help us to process all the changes we’re experiencing. They might be able to help us to brainstorm ideas to tackle some of the challenges we’re facing. Sometimes we just need the time and space to talk everything through. We could talk things through with family members, friends, or professionals. If we can’t meet up with them in person, we could arrange a phone call, a skype chat or we could text them. New places and people can be incredibly anxiety-provoking. Having something comforting can help to reduce that anxiety. If we’re starting a new job, we could wear one of our favourite jumpers. When we’re away from home we could take a familiar blanket, some photographs or a soft toy. If we’re starting a new school we could pop our favourite chocolate bar into our lunchbox. Having something familiar can be comforting and reassuring. Big changes are exhausting. We have to try and make sense of completely new environments, people and routines. It’s an awful lot for our brains to take in. When depression is already zapping our energy and our brains are struggling to digest what’s happening, managing change can be even more exhausting. It’s important to try and plan in rest time to give ourselves time to adjust. We don’t want to completely wipe ourselves out. Having activity-free evenings and weekends until we adjust can be helpful. If we get a lunch break then we could try to go off somewhere quiet to give us a bit of breathing space mid-way through the day. Having enough sleep will help us to feel more able to tackle any challenges that the changes in our life bring up. Sleep can be particularly tricky if we’re anxious because our worries can keep us awake. Winding down before bedtime each night and trying to get to bed on time can be a good start. Even if we don’t manage to sleep, just lying in bed can give us a bit of rest. When we go through big life changes, it’s a huge amount for our brains to cope with. It can take a lot of energy. Depression slows our brain down and can make it harder to think and to cope with lots of new information. It helps to be mindful of what we’re eating as a balanced diet will help to power our brains through all of these changes. Many people find routine to be helpful; it helps us to remember things, it helps us to know how long things take, it can take away some of the tedious decision-making and it can help to reduce our anxiety. When we experience change in our lives, we quite often feel the impact of that change on our daily routines. Routines which anchor us and serve as a safety net for us when the world feels a bit topsy-turvy. It can take a while to re-establish, and some jiggling, to get a routine that works for us. But once we find one, it can be an important tool in helping us to feel settled. It takes time for the dust of change to settle. We may feel disorientated for while and experience frustration that it’s taking us so long to adjust. It’s important that we are patient with ourselves – beating ourselves up really won’t help. Coping with change is incredibly difficult yet we feel bad when we can’t ‘take it in our stride’. We focus on how we ‘should’ be feeling and on the complexity of emotions which bubble below the surface. Very rarely do we give ourselves a pat on the pack for all of the steps we’ve taken. Celebrating little positives is really important. When we take a pause to reflect on, and notice, our achievements, we shine a light on the effort we’ve made and on the fact we’ve bravely faced some fears. 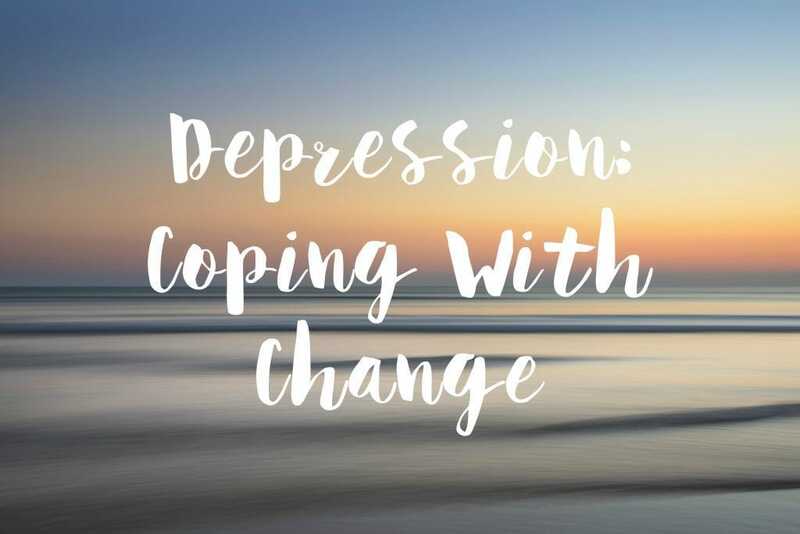 Change is a big thing, and sometimes we need some extra help and support until we’re more settled. There is absolutely no shame in asking for help – it’s a sign that we recognise our limits, a chance to learn from others. We could get help from our health professionals, teachers, family members, friends, or our workplace. Sometimes we will just need a bit of a chat and some help wrapping our heads around things. At other times, we might need changes making to our new situation. It could be things like such as workplace adjustments or extra support at school. A bit of extra support can be just what we need to keep things on track and to prevent us from becoming overwhelmed. Our situation might have changed. The people around us might have changed. But we are still us. Unless, of course, we have chosen to change. Wherever we are in the world. However far we have moved from friends or family. We are never, ever, alone. There are so many different ways we can stay in touch with our loved ones. We can use social media, or email. They’re often on the end of a phone call or a text. We can even try writing letters or sending post cards if we like snail mail. However dark and difficult things might seem we are never alone and we’re never a burden. If the shoe were on the other foot, we’d relish the opportunity to show others we care. Our friends and family feel the same way about us. Everybody feels wobbly when going through big changes. Even when we identify that the change is a healthy one for us, there’s still that wobbly period where we’re trying to find our feet again. It’s absolutely okay not to feel okay. We need to be kind to ourselves. Eventually we will settle into our new situation, it might just take a bit of time. Please help us to help others and share this post, you never know who might need it.